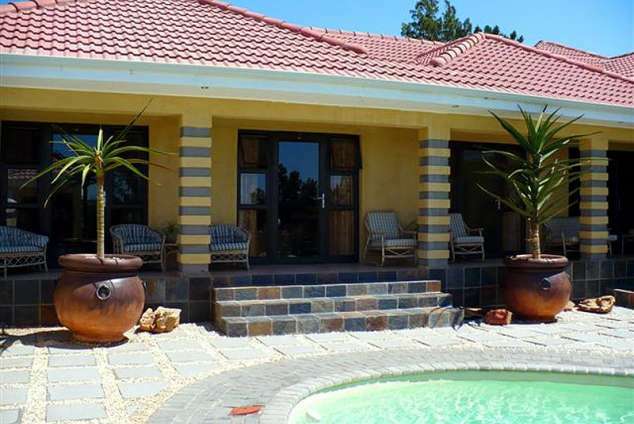 Mi Casa Guesthouse - Uitenhage Accommodation. Our Luxurious Five Star Guesthouse is situated in the heart of Uitenhage, 35 minutes drive from PE Airport and Addo National Elephant Park. Mi Casa was designed and built in 2006 as a Guesthouse and conference facility and has been operating successfully ever since. Focusing on the corporate entity be ensured that this will be your home away from home. Ideally situated and designed for corporate / private functions. An absolute must for wedding photo's and honeymoon breakaways. En Suite Rooms Honeymoon Suite with Jacuzzi. Executive Rooms with separate entrances. Private Garden Rooms leading to the swimming pool. Laundry Facilities Breakfast and Dinner available. All inclusive Full day and Half day conference packages. Shuttle service to / from the Airport. 24089 page views since 13 Aug, 2009.